Did you know that you can discover real ghosts at the Oxford Castle in Oxford, England? Several individuals both professional and just ghost hunters at heart have obtained many different ghost pictures and ghost videos at this spooky castle. Here, you will experience unexplained phenomenon, energy recordings of past events, and more! You can meet the “dark figure” that lurks in the crypt that is built underground, and several other types of paranormal activity that is bound to frighten and excite all at once! Here, you will learn about the real ghosts that can be discovered at the Oxford Castle in Oxford, England. The Oxford Castle has served many different purposes throughout history. It has been around for about one thousand years, so many individuals – both of the physical world and the spiritual world have roamed the yards and corridors of the cold, stone structure. At one point, it served as a functional prison for the most dangerous criminals. In another time period, it served as a home for a family that was considered to be royalty. It has also played a vital role as a hotel. Deep beneath the physical structure of the castle, there are a number of frightening dungeons and tunnels that can unnerve even the professional ghost hunter. 1. It is believed that a spirit by the name of “Matilda” lingers along the steps of the notable stairwell within the Oxford Castle. The individuals who have seen this spirit state that she does not seem to interact with the living on an intelligent level, but that she appears to simply linger up and down the stairs and even sit on them as if she is waiting for someone. 2. Many have stated that there is a “dark figure” that appears to linger in the area of the crypt where dead bodies were stored underneath the structure. This is believed to be an ominous character who frightens all that encounters it. Ghost pictures and ghost videos alike have captured this spirit. 3. Many claim that they can hear other people talking, screaming, and crying. Many who have experienced these hauntings often find that while they are excited to have such an encounter, it almost makes them queasy. 4. Several different apparitions that appear to be of various time periods are said to linger in the Oxford Castle at various locations. Documentation reports that several of these spirits appear as a faint mist, while others seem to contain a strong sense of energy and almost appear to glow when observed. 5. Several orbs and rods have been documented both visibly and on film. 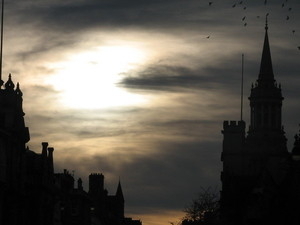 Overnight ghost hunts are available on specified dates.